NEW YORK CITY — Dr. Bas Rokers, associate professor of psychology at the University of Wisconsin – Madison, presented on motion perception in three dimensions during SUNY Optometry’s Schnurmacher Institute for Vision Research colloquium on Friday, November 9. Dr. Rokers researches accurate perception of visual motion. 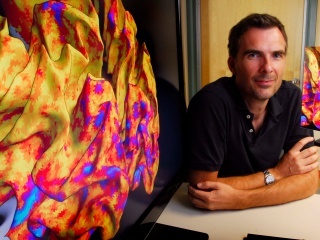 His lab aims to increase understanding of the neural mechanisms underlying motion and depth perception using behavioral experiments (psychophysics), neuro-imaging (fMRI) and computational modeling. Their recent findings suggest that 3D motion perception is based on two distinct signals, binocular disparity and monocular motion. He earned his bachelor’s degree in artificial intelligence from Utrecht University, master’s degree in behavioral neuroscience from Rutgers University and his doctorate in cognitive neuroscience from the University of California at Los Angeles. He was also a post-doctoral fellow in visual perception at the University of Texas at Austin.